In a post earlier this month, we looked at a team of astronomers searching for stars that were on ejected from their birthplaces in clusters. These stars could receive the needed kick from a gravitational swing by the core of the cluster to achieve a velocity of a few tens of km/sec. But a similar mechanism can function in the cores of galaxies giving stars a speed of roughly 1,000 km/sec, enough to leave their parent galaxies. A new study asks whether we have ever witnessed any of these stellar cast offs explode as supernovae. The team, led by Peter-Christian Zinn at Ruhr University in Bochum, Germany, searched through roughly 6,000 supernovae listed in the Sternbarg Astronomical Institute Supernova Catalog, for which no host galaxy was apparent, yet werent too distant from any known galaxy. The latter criteria was added because, even at the high velocities, stars still couldnt get too far before they reached the end of their fuses. The team imposed a rough inner cut off of around 10 kiloparsecs (roughly 1/3 of the width of the disk of the Milky Way). They expected stars should be at least this distance from the cores of the parent galaxy. The initial list contained five candidate stars, dating back as far as 1969. The first step the team used to determine if the supernova was truly in a galaxy or not, was to take long exposure images of the immediate area, to draw out potential low surface brightness hosts. The team also used archival data in the far ultraviolet as well as the x-ray spectrum to determine whether or not the nearby galaxies from which the supernovae could potentially be ejected had an extended disk, invisible in the visible portion of the spectrum that would have allowed the progenitor star to form in the outskirts of the galaxy. These wavelengths are tracers of ongoing star formation which are sites in which high mass stars that would lead to core-collapse supernovae, would likely be found. The oldest candidate, SN 1969L, was located near the flocculent spiral NGC 1058. While the deep exposures did not show a host galaxy, the x-ray and UV images both showed some extended structure of the parent galaxy at the distance of the supernova. This led to the conclusion that this supernova, while far removed from its host galaxy, was still gravitationally tied to it. With the second candidate, SN 1970L, the team again failed to find any faint host galaxy. 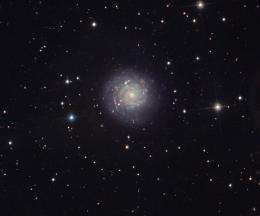 However, the supernova was situated between two galaxies, NGC 2968 and a faint elliptical, NGC 2970. A 1994 study had revealed a faint bridge of matter connecting the two, implying that they had had an interaction in the past. This interaction would likely have pulled off gas and stars, of which SN 1970L could have been one. SN 1997C was the third candidate and also lacked a discernible host galaxy, even with long exposures. This one also did not have an indication of an extended disk of which the supernova could have been part. Given the characteristics of the supernova, the team estimated that it had an original mass of 15 times that of the Sun. Given its projected distance and the lifetime of such stars, the team noted that this would correspond to a velocity of some 3,000 km/sec, which is several times the speed of the highest confirmed hypervelocity star. As such, the team expected that this star would have to be ejected in a similar manner to SN 1970L, using an interaction between galaxies. Given that the host galaxy is known to be one in a small cluster and the disk shows some signs of perturbation, they suggested this was likely. The fourth candidate, SN 2005nc, the team selected because there was no nearby galaxy they could assign as a possible parent. They suggested this was due to an extremely distant host galaxy, too faint to resolve with previous studies. The basis for this assertion was that the supernova came with a gamma ray burst that indicated an origin some 5-6 billion light years distant. Due to the associated GRB, the Hubble telescope swung in to take a look. These archival pictures failed to reveal any objects that could readily be identified as host galaxies leaving the team to presume the host was simply too far away to resolve. The last candidate was SN 2006bx located near the galaxy UGC 5434. This supernova did not appear to be in a faint background galaxy and did not have hints of being formed in an extended disk. The estimated velocity from the projected distance was ~850 km/sec which placed it in the realm of plausible speeds for stars ejected by gravitational assists from the supermassive black hole at the center of galaxies. I.e., "Supernovae without host galaxy?" may be a natural consequence of successive fragmentation induced by neutron repulsion . Observational evidence for successive fragmentation of cosmic objects was reported several years ago [2-7]. 2. W. K. Brown, Astrophys. & Space Sci., 72, 15-31 (1980). 3. W. K. Brown, Astrophys. & Space Sci., 121, 351-355 (1986). 4. W. K. Brown, Astrophys. & Space Sci., 122, 287-298 (1986). 5. W. K. Brown and L. A. Gritzo, Astrophys. & Space Sci., 123, 161-181 (1986). 6. W. K. Brown, Astrophys. & Space Sci., 126, 255-267 (1986). I think the homeless supernovae, and the disgraced ex-professor, Oliver K Manuel should both get a job.